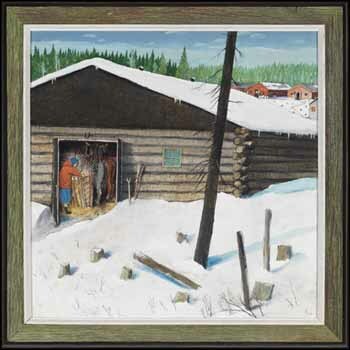 After his conversion to Catholicism in 1957, William Kurelek sought to emulate the example of Christ in his own life. He turned away from his own personal problems and torments, images that had occupied his work for some years, and sought to better the lives of others through painting. 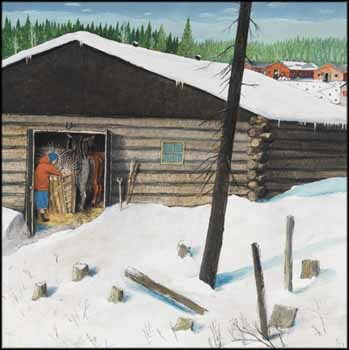 Here, Kurelek has taken an authentic Canadian scene and placed it in a biblical context, and through his sincerity of message, it is fully convincing. The figure who represents Mary is dressed in clothing typical of Manitoba's Ukrainian farm women - right down to her gumboots. These details add to the authenticity of the scene. The stumps indicate that this is a logging camp - Kurelek had worked as a logger himself. The loggers in the distance rush hungrily into the cookhouse, oblivious to the scene unfolding in the barn a short distance away.